Message from the Editor: Hello readers! We really appreciate your input on the students' research. Please share your opinion on the science and the writing of the paper on our Forum. The Japanese barberry is an invasive plant, meaning it thrives in foreign environments by overpowering the area’s native plants. Barberry lowers the pH of the soil, thus making the environment too hostile for indigenous plants. It attracts deer ticks. This experiment observes how the existence of one species impacts the condition of another. In particular, the data measured how the population of Ixodes scapularis (black deer tick) was affected by the removal of the invasive plant species, Berberis thunbergii (Japanese barberry). The data concluded that deer ticks were no longer able to thrive in their environment without the existence of the Japanese barberry. As the amount of Japanese barberry decreased in the research site, the amount of ticks diminished accordingly. The cut-and-spray method was used in this experiment. This technique requires the Barberry chute to be trimmed until only 2 inches of the stem remains. It was then sprayed with 3 mL of a highly diluted glyphosate solution*. The substance was applied with a spray bottle with a full cone nozzle pressure of approximately 30 psi. Consequently, the solution makes direct contact with the plant and excess runoff was avoided. When the plant conducts photosynthesis, it spreads the solution throughout its vascular system, thus killing the plant. This procedure yields less collateral damage than burning the bushes or releasing biological controls. In addition, it successfully eradicated 92.5 % of barberry bushes in two applications. *The glyphosate solution was approved by the Connecticut Health Department, and its use in this experiment satisfied local environmental protocols. Ecosystems are exceptionally intricate and incredibly fragile as their sustainability depends on their inhabitants. For example, if a specific species of plant or animal were to suddenly disappear, the rest of the food chain would not function correctly. Consequently, the entire balance of the local environment is thrown into disarray ((Cunningham, William P., Mary Ann Cunningham, and Barbara Saigo. "Resilience and Stability Make Communities Resilient to Disturbance." Environmental Science: A Growing Concern. 9th ed. Boston: McGraw, 2007. 91. Print.)). Japanese barberry is an especially troublesome invasive plant. It upsets the natural flow of ecosystems by making it difficult for indigenous species to thrive in their native environment (("Invasive Species." Biology. Ed. Richard Robinson. New York: Macmillan Reference USA, 2009. Science in Context. Web. 7 Oct. 2013.)). Japanese barberry houses deer ticks which can carry Lyme disease. Lyme disease is a large issue in the Northeastern United States ((Collins, G. "The Tale Of Ticks and Other Excess." New York Times 31 May 2012. Gale Science In Context. Web. 2 Sep. 2012.)). Additionally the Japanese barberry encourages the development of the red wiggler worm, another invasive creature. The Japanese barberry deprives native plants of nutrients, thus killing them. The dead vegetation becomes leaf litter, which red wigglers consume ((Maerz, John. “The Impact of Non-Indigenous Plant Invasions on Woodland Salamander Fitness and Abundance” Invasive Plants. N.p. 2002. 7 Oct. 2013.)). These creatures are relentlessly ravenous; thus, they eat the duff layer which typically provides a home for tiny forest-dwelling animals ((Dunne, N. "Invasive Earthworms-A Threat to North American Forests" Plants and Gardens News. Spring 2004. Print.)). There are various ways to extract nonnative species from an ecosystem. The government’s method for Barberry removal involves using a small amount of accelerant to start a controlled forest fire and incinerate any trace of the plant ((Williams, S.C.,Ward, J.S., Worthley, T.E. ,Stafford, K.C. 2009. Managing Japanese barberry infestations reduces blacklegged tick abundance and infection prevalence with Borrelia burgdorferi. Environmental Entomology. 38(4): 977-984.)). While the government’s method has been successful, the use of fire presents a great risk of collateral damage. Native plants are harmed in these fires as well; consequently, this process is more detrimental than beneficial. The technique used in this particular experiment involved a chemical solution consisting of 70% water and 30% Roundup. Applying herbicides to the plant is a direct method that ensures results because the chemicals move through the xylem and phloem, the tissues that facilitate the transportation of water and sugar, respectively ((Managing Invasive Plants (2009) Retrieved December 2, 2012, from http://www.fws.gov/invasives/staffTrainingModule/methods/chemical/impacts.html)). Within hours the chemical moves throughout the entire plant and the lethal mixture permeates the plant’s cells. This direct strategy ensures minimal damage, maximum effectiveness, and increased efficiency by focusing on a single plant at a time. Because the practice is so contained, the surrounding area has a lowered risk of being impacted by the process. Purpose: This experiment was implemented to explore effective methods to remove invasive plants which would lead to a subsequent decrease of harmful deer ticks. With the application of glyphosates comes justifiable apprehension about the possible ramifications. People are aware that these chemicals can be harmful to an ecosystem’s health. Thus, appropriate steps were taken when using the chemical. First and foremost, the method for applying the solution was direct and calculated. Only a small area was actually exposed to any chemicals. The area was monitored and cleared so that the chemicals do not linger or make contact with soil or waterways. For the protection of those conducting research, masks, gloves, and goggles are necessary. Thorough washing of clothing and proper disposal of items that came into contact with the glyphosates are additional provisions. Before applying the extraction procedures, the research area was surveyed in order to find the locations of each individual Japanese barberry plant. This occurred throughout September 2012. On September 2, 5, 8, 12, 15, 22, and 26, the field was mapped. Thirty four Japanese barberry plants were discovered throughout the area (Image 2) . Of these thirty five, nineteen received the herbicide solution. The research was conducted in three zones. Zone one included bushes 1-6, zone included bushes 7-12, and zone three held bushes 13-19. After the observations were made, the cut-and-spray-with-herbicide method was used to remove large amounts of the Japanese barberry plants. The barberry chute was clipped until only 2 inches of the stem remains (Image 3). was then sprayed with 3 mL of the diluted chemical solution. The substance was applied with a spray bottle with a full cone nozzle pressure of approximately 30 psi. The settings used on the spray bottle ensured that a concentrated, albeit fine stream of substance would be released. Consequently, the solution makes direct contact with the plant and excess runoff was avoided. When the plant conducts photosynthesis, it spreads the solution throughout its vascular system, thus killing the plant ((Ehrenfeld, J. G. 1999. Structure and dynamics of populations of Japanese barberry (Berberis thunbergii DC.) in deciduous forests of New Jersey. Biological Invasions 1: 203-213.)). The dead vegetation was then cleared from the area. This method was employed on the first day of research, November 14, 2012. The next step was to reduce barberry population on campus and around the area. Barberry stunts the growth of local trees because it lowers the pH of the soil around the plant. Compared to knotweed, these plants are relatively easy to destroy yet are extremely difficult to completely remove. For barberry this was largely due to the fact that one plant can be responsible for all the up chutes within a 150-foot radius and the center tends to be deep underground. Its ability to span such an area means it has an extensive amount of biomaterial, which must be destroyed, only adding to the problem. The method was to cut the vines, letting them dry and fall from the tree while applying Round up to the subterranean side of the vine to stunt or stop growth in that area. As a potent herbicide, Roundup was effective in killing the harmful invasive plant. Barberry houses European red wiggler earth worms, another invasive species, which destroys the undergrowth of the forests. Consequently, the land is more susceptible to soil erosion ((Ehrenfeld, J. G. 1999. Structure and dynamics of populations of Japanese barberry (Berberis thunbergii DC.) in deciduous forests of New Jersey. Biological Invasions 1: 203-213.)). The Japanese barberry bushes were cut by using hedge trimmers. In spite of its vulnerability to Roundup, barberry’s thicket-like growing patterns make it difficult to discern the extent to which the plant has been killed. Any remaining plants present the risk of housing earth worms, ticks, and field mice; each being either invasive or a nuisance. Monitoring the changes in the tick populations required quantitative data. Strips of adhesive tape were swept across the branches of barberry in order collect ticks and find their population size per bush. After averaging the tick population for the nineteen bushes, it became evident that each plant houses approximately 28.48 deer ticks (graph 1). The standard deviation was 4.74. The solution was applied for the second time in 2013 on March 15, March 26, April 2, 9, May 12, May 14, May 28, and June 12. After the second application of the solution, the average population had decreased by a total of 92.5%. Each bush had an average of 2.3 ticks, with a standard deviation of 1.08. There was a dramatic decrease after the first treatment and it continued to decrease as the progress continued over time. On June 26, the final census was conducted. Graph 3 depicts the results. The tick population plunged as Japanese barberry was removed from the area. Similarly, the worm population went down as the Japanese barberry decreased. In order to census worm populations, the entire research area was divided into rectangles. After the duff layer was temporarily removed, holes with a depth of 10 inches were dug. These holes were then excavated for worms. The worms were placed on a scale, and the masses were calculated. On September 28, 2012, there was a mass of approximately 3.966 kg of worms in the research site. Zone 1 had 1.334 kg of worms. Zone 2 had 1.831 kg of worms, and zone 3 had 0.801 kg of worms. After the Barberry was removed, the total amount of worms had decreased to 1.927 kg. On March 13, 2013, zone 1 had 0.702 kg, zone 2 had 0.792 kg, and zone 3 had 0.433 kg of worms. On June 30, 2013 when in the presence of indigenous plants, the entire population lowered to approximately 0.983 kg. Zone 1 had 0.417 kg of worms, zone 2 had 0.524 kg of worms, and zone 3 had 0.042 kg of worms. Graph 4 depicts the progression of zone 1; graph 5 corresponds to zone 2, and zone 3 shows zone 3. The progress in the experiment was also measured qualitatively. The research area was photographed before and after each session. Below is an example of the immediate physical impact the experiment had on the community. This project has the potential to have a global impact. In addition to immediate ecological benefits, it can be concluded that this experiment will yield positive medical results. If other communities were to replicate the project, it would be a constructive investment of time and effort. Lyme disease can be a fatal affliction. The Lyme disease that deer ticks can carry has potential implications such as neurological damage, severe fatigue, and cardiac irregularities ((Collins, G. "The Tale Of Ticks and Other Excess." New York Times 31 May 2012. Gale Science In Context. Web. 2 Sep. 2012.)). Emulating this project would allow others to eradicate the source of the issue and prevent its spread. Furthermore, the overarching idea of removing invasive species can help communities in every corner of the globe. From the oceans to the rainforests, indigenous life is being destroyed by species which do not really belong there. Native species should be able to thrive and contribute to their natural habitats. Variation within these ecosystems is integral and all environmentalists should work to ensure that local habitats will always be protected. Conducting more trials of the experiment would help ensure that the data was even more reliable. There are several variables that could have potentially compromised the data to an extent. The weather conditions and available food sources could have also contributed to rapid decline of the tick population. 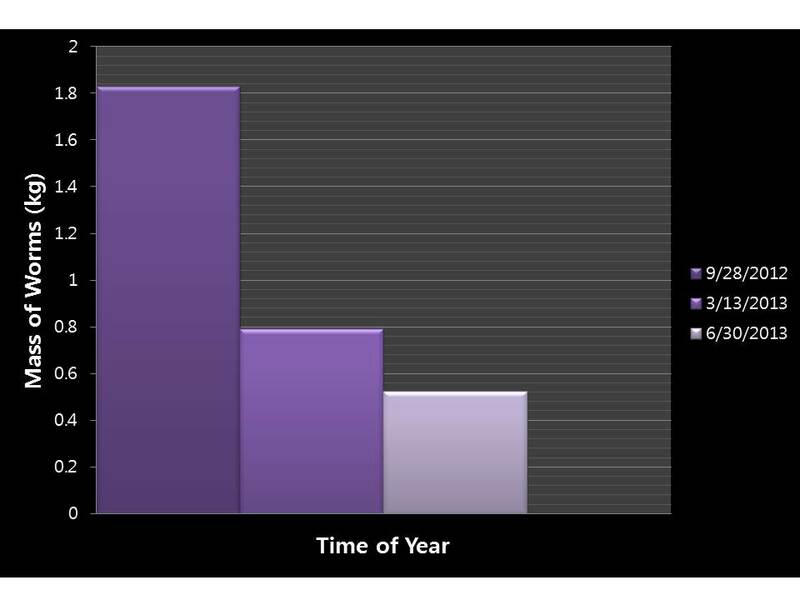 There were three major time periods for data collection: fall 2012, spring 2012, and summer 2012. It can be seen that the highest levels of ticks were present when there was an abundance of Japanese Barberry plants. A destructive tick species thrived with an equally harmful plant species. With the invasive vegetation removed, their numbers began to dwindle and when indigenous plants were reintroduced, the population plummeted. This same phenomenon occurred with the Red wiggler worm. From an ecological standpoint, it is clear that the ecosystem of the area is intricate. The experiment removed one critical piece of the environmental puzzle; thus, impacting the entire structure. In this particular experiment, a control was needed to reinforce the data. Having an area with no solution would have shown whether or not the herbicide was effective. Although the process reduced ticks on the barberry, the surrounding plants were not checked for tick populations. Additional research can be done from a medical standpoint. In order to determine the true impact of experiment, health organizations can discern whether the volume of local Lyme disease diagnoses have decreased in the months following the project. Furthermore, this experiment can be replicated to increase validity of the results. So what was your hypothesis prediction?